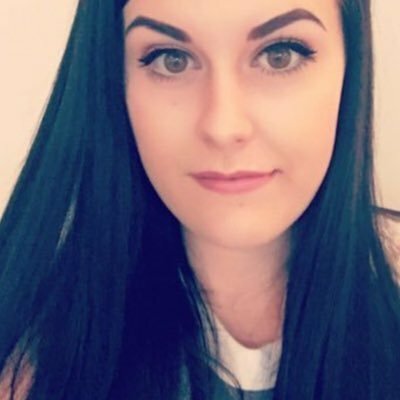 There is not a day that goes by that I don't wear winged liner - I don't feel myself without it! I find it difficult to find a good eyeliner that will be easy to use to create a wing that matches on both eyes while being super black - and I have just found it! From the first time I used this I knew it was going to quickly become holy grail status and it already has. New from Lancôme is the Grandiôse Liner which is available in three different shades, I have 01 Noir Mirifique which is the black shade. 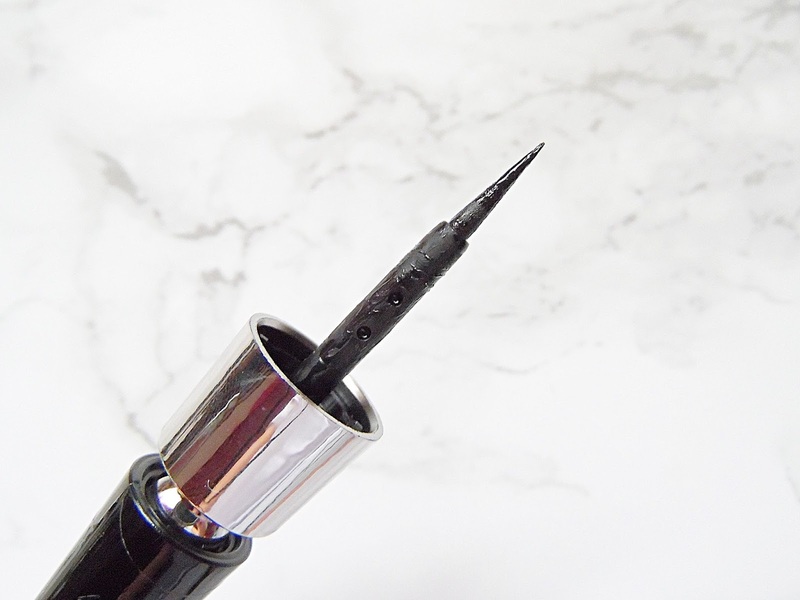 This liner is a liquid formula and it is different to any other liner in my collection as you can adjust the wand. It is an innovative eyeliner which makes it even easier to create the perfect wing as you can adapt the wand for your unique eye shape. 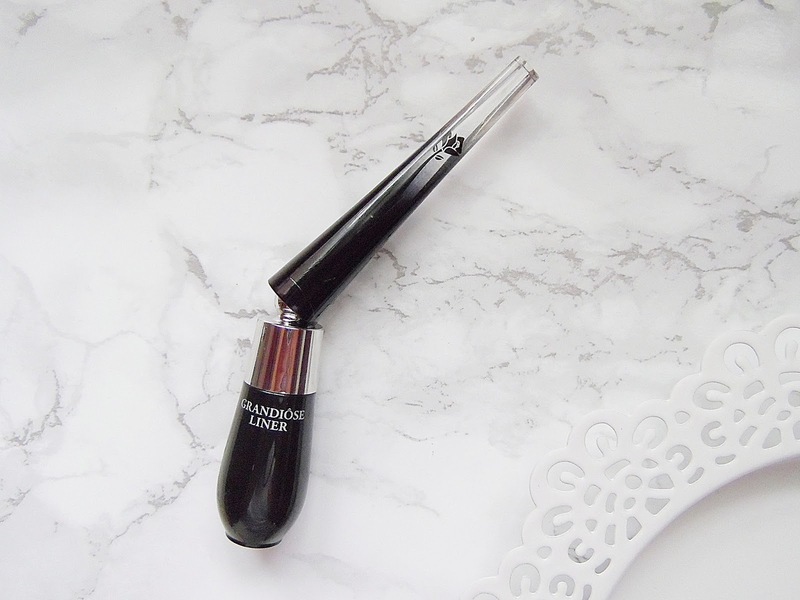 I haven't used a liquid liner in so long, I have been a long time fan of pen liners, but I have been converted back and I don't think I will be able to use anything else now I have this one in my makeup bag. If black isn't for you there are also a brown and blue version available, I really want to get my hands on the blue version! This eyeliner has a incredibly thin tip which makes it so easy to create any eyeliner look that you like, as it is so thin you can slowly build up the thickness without making any mistakes and having to start again. And because of the bendable wand, you can change it to find out the easiest way to apply your eyeliner. 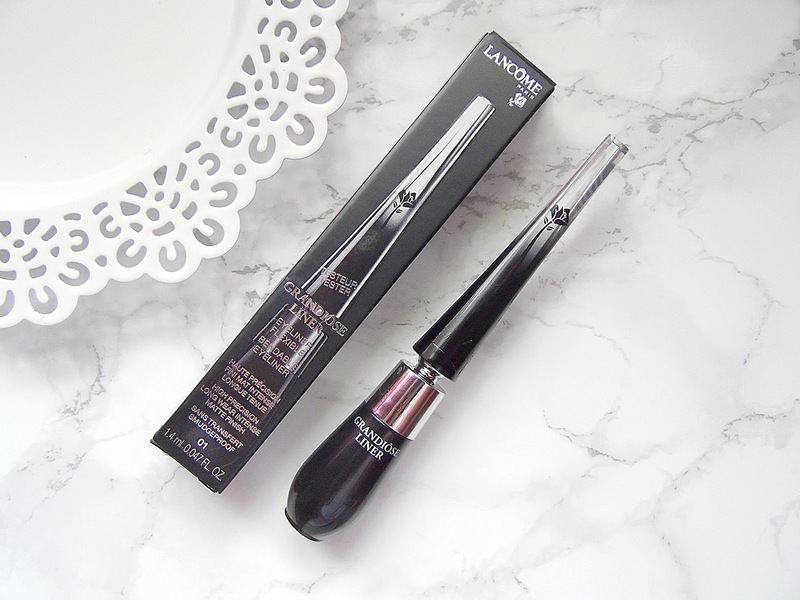 I find it works best for me to apply the liner to my upper lash line with the wand straight and then bend it to create the wing - I am yet to make a mistake doing my liner since I started using this one from Lancôme! I have always struggled to get my eyeliner to match on both eyes, it might end up having a longer wing on one eye or too thick on the other but honestly since I started using this it has matched every single day! It is basically fool proof. Another amazing thing about this liner is that it is incredibly black, it is the blackest eyeliner I have ever used and it doesn't fade (or budge for the matter) at all throughout the day. I have actually lightly rubbed my eyes a couple of times and my eyeliner does not move. As you apply the intensely pigmented liner to the upper lash line it does look very glossy but it is very fast drying and sets to a matte finish which I love. It looks so smooth on the eyes too and there is no need to reapply throughout the day as it is so long lasting. I can apply this at 5am and at midnight it still looks perfect - I have never found that with any other eyeliner before! If you are a huge fan of winged liner (or any liner look for the matter), you need the Lancôme Grandiôse Liner in your life. It retails for £23 - HERE.